It’s been said that some people want it to happen, some wish it to happen and others make it happen. Beverly Rose Hopper and Terry Reilly are two people making it happen. The two are co-founders of the new Friends of the San Jose Rose Garden group, and their efforts are already making a difference in San Jose’s landmark park. The 11-acre San Jose Municipal Rose Garden, at the corner of Naglee and Dana avenues, is home to more than 3,500 plantings and close to 190 varieties of roses. The former prune orchard was donated to San Jose in November 1927 for a park with the city agreeing to set aside half of the land for a garden. However, six years passed before the groundbreaking took place and another six before it was finished and formally dedicated on May 15, 1937. Its 70th anniversary passed unmarked this year, but the park itself received a lot of publicity in April when newly elected District 6 San Jose City Councilman Pierluigi Oliverio held a news conference there calling for park maintenance to be taken away from city staff and outsourced to a private firm. City staff agreed that the park was not in good shape, blaming budget cuts that had reduced staffing at the park from 15 shifts a week in 2004 to eight shifts in August 2005. Ironically, 2005 was when the Rose Garden underwent a $2 million upgrade. Illness and transfers in 2006 and early 2007 left the park operating with just four shifts a week. While Oliverio’s call for outsourcing was soundly rejected by the city council, it did focus attention on the garden’s plight. Enter Reilly and Hopper, both longtime neighbors of the Rose Garden who both had volunteered in the park in years past, but not recently. Hopper, twice president of the Santa Clara County Rose Society, says she and many other rosarians stopped volunteering in the park because of the use of Roundup as a weed killer. “It would get a little frustrating because a lot of the problems were due to use of Roundup and non-selective herbicides,” Hopper says. Their first public effort was a volunteer day on Sept. 15 where they invited people to bring gloves and clippers to help deadhead the roses and weed the beds. Although optimistic, the two were surprised with the turnout of 150 volunteers. “We were ecstatic; we were overwhelmed,” Hopper says. After tabulating the information, Reilly found that only 20 volunteers lived nearby. Around 50 came from the local 95126 ZIP code, and all the rest were from other areas of Silicon Valley. Hopper says she particularly enjoyed talking to volunteers about why they turned out and why the garden is important to them. “One of the volunteers said she lives in an apartment and doesn’t have roses, but the first place she takes visitors after picking them up at the airport is to the Rose Garden, where they can stretch their legs,” Hopper says. 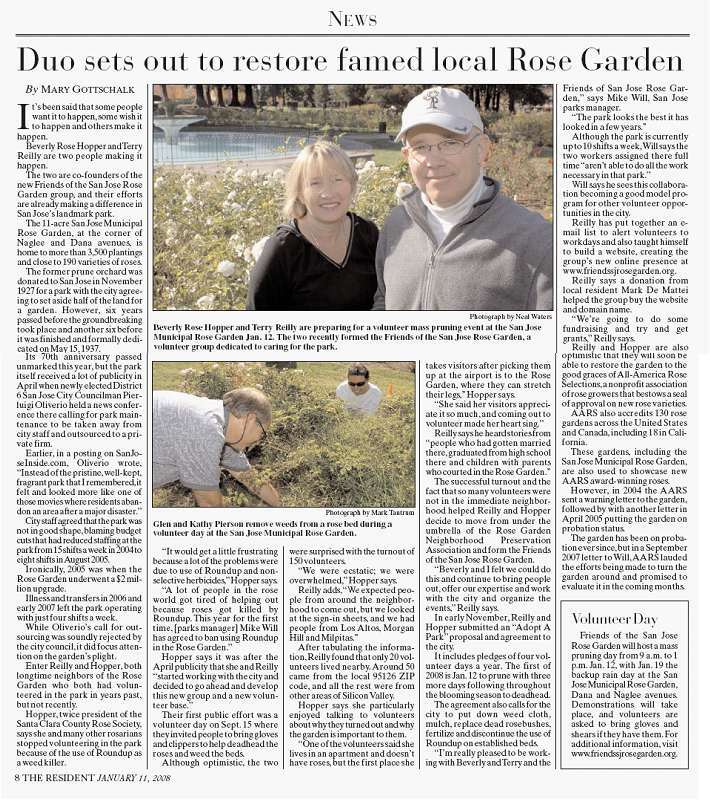 The successful turnout and the fact that so many volunteers were not in the immediate neighborhood helped Reilly and Hopper decide to move from under the umbrella of the Rose Garden Neighborhood Preservation Association and form the Friends of the San Jose Rose Garden. “Beverly and I felt we could do this and continue to bring people out, offer our expertise and work with the city and organize the events,” Reilly says. In early November, Reilly and Hopper submitted an “Adopt A Park” proposal and agreement to the city. It includes pledges of four volunteer days a year. The first of 2008 is Jan. 12 to prune with three more days following throughout the blooming season to deadhead. The agreement also calls for the city to put down weed cloth, mulch, replace dead rosebushes, fertilize and discontinue the use of Roundup on established beds. “I’m really pleased to be working with Beverly and Terry and the Friends of San Jose Rose Garden,” says Mike Will, San Jose parks manager. Will says he sees this collaboration becoming a good model program for other volunteer opportunities in the city. Reilly has put together an e-mail list to alert volunteers to workdays and also taught himself to build a website, creating the group’s new online presence at www.friendssjrosegarden.org. Reilly says a donation from local resident Mark De Mattei helped the group buy the website and domain name. “We’re going to do some fundraising and try and get grants,” Reilly says. Reilly and Hopper are also optimistic that they will soon be able to restore the garden to the good graces of All-America Rose Selections, a nonprofit association of rose growers that bestows a seal of approval on new rose varieties. AARS also accredits 130 rose gardens across the United States and Canada, including 18 in California. These gardens, including the San Jose Municipal Rose Garden, are also used to showcase new AARS award-winning roses. However, in 2004 the AARS sent a warning letter to the garden, followed by with another letter in April 2005 putting the garden on probation status. The garden has been on probation ever since, but in a September 2007 letter to Will, AARS lauded the efforts being made to turn the garden around and promised to evaluate it in the coming months.